Two beautiful African Cichlids for sale. Possibly South American. Does it matter? They're fish. They're yellow. You're watching them swim, not talking to them. Fish are flexible and won't mind moving. I watched them from their first days when they were hatched into their mother's mouth. Yes, it's weird, but that's what happens. I rejoiced as they were first released and allowed to swim on their own, cried when so many of their brothers and sisters were eaten by other fish in the tank. Okay, I didn't cry so much as cringe, but these two survived, so they're probably the smartest or strongest of the litter. Pack? School? Whatever. These two fish were born at a large office at Microsoft, but later adopted and moved to a cubicle at Apple. One fish seems to have made the transition completely, although I often find the other scratching "I'm a PC" in the gravel. Fish were expecting to stay at Apple, but when adoptive father, my husband, moved to another competing company, fish were relocated to our home. Fish were instrumental in the launch of the iPhone and may be aware of much of Silicon Valley's intellectual property. Wouldn't even begin to know how to tell you the genders of these fish but I'm pretty sure they are the same, since they have not bred their current tank, despite what I am sure are optimal breeding conditions. Fish are approximately 6 years old. You'd think they'd be dead by now but apparently they are just scraping middle age. Ten gallon tank requires minimal care. Just change the water when you can no longer see in the tank. At least that's what my husband does. When water levels get low enough, noise from filter will make you believe you have a waterfall in your living room. Great for those who enjoy white noise for sleeping. Warning: sound will also make you want to pee. 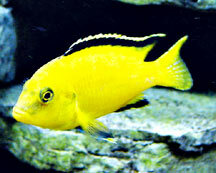 Cichlids are known as "aggressive" but as far as I can tell, they only fight with other fish. They have never harmed any children, especially young, sensory-seeking boys who like to put their hands in the tank. Fish may hide behind plastic plants (included) for days after such incidents but they seem fine. Will include extra fish antibiotics. Today's post inspired by The Red Dress Club: We want you to imagine you've just had a fight with a friend, a co-worker, husband, significant other, child - you get the picture. You're mad. It's time for revenge. What would you sell? Write a humorous listing for eBay or Craig's List. Talk about the history of the items, why they must go.